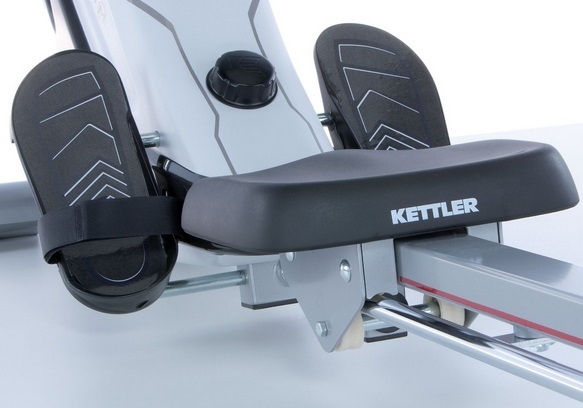 Yes we know it's a stereotype, but this German designed and built rowing machine is about as clinical and functional as they come. It looks different to most of the rowers on the market, but it doesn't stand out in the crowd in a good way. Of course taste is a personal thing, but none of us on the team were knocked out by its looks and the same goes for most of those who sent us their views. But, you're not buying a piece of art, you're buying a rower and the majority of those who have used it were impressed by its smooth action and very quiet resistance mechanism. 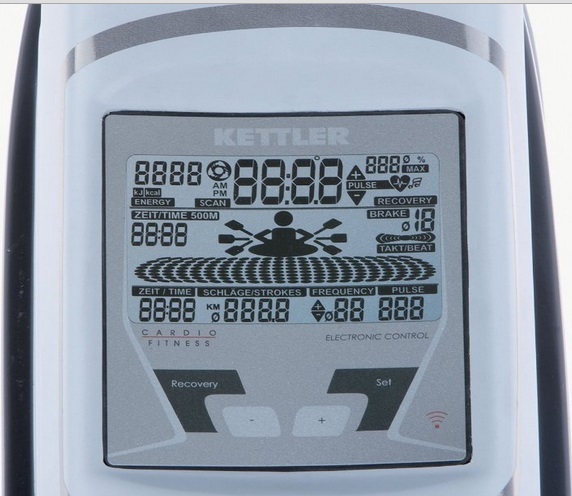 We've tried two Kettler rowers previously and found them to be good quality machines. They were around half the price of this one and both were hydraulic machines - see Outrigger and Favorit. But the Coach M is a very different kind of beast to these two. Assembly was straight forward and took around 30 minutes. 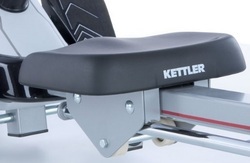 The rowing position is great with well design footplates and a thick padded seat.that provides plenty of support. The action is good as the seat slides nice and smoothly on the rail guided by rollers on two bars beneath. The magnetic resistance is probably one of the quietest we've tried - you can easily listen to music and even the spoken voice on the radio when working out. There are 10 levels of resistance that can be selected by turning a knob beneath the console. We were slightly surprised by this as magnetic rowers usually perform this function digitally with a button. This isn't a huge problem but it just seemed out of place on an otherwise hi-tech piece of kit. However, if you well-built or like a challenging workout, you may find the resistance is not challenging enough. One nice surprise is that the Coach M comes with a T34 wireless chest strap that transmits your heart rate to a receiver in the console. Your heart rate is displayed on the screen and can be used for heart rate training programs. When you're finished training, the Coach M easily tilts up and can be moved on its castors and stored vertically out of the way. Unusually, the Kettler comes with two extra plates (a backboard and footplate) so you can use the handle for additional exercises such as biceps curls. Some may find this useful but we thought it's a distraction from rowing and we bet most will store the plates away and never use them again. And finally, Kettler put their money where their mouth is (anyone know where that turn of phrase comes from?) and include a generous warranty. The Coach M comes with a lifetime on the frame and all other parts are covered for three years - now that brings peace of mind. ﻿First impression on the display (See right) - there's a lot going on! In fact, it looks a little too busy without really telling you more than other displays that are easier to read. It displays calories, distance, stroke rate and time, plus your pulse rate - see comments above It wasn't to our taste but some people will love the large LCD readout with its graphic representations. Note, the console is battery operated and requires no external power source. 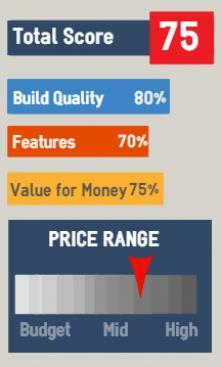 There's a lot of competition in this price bracket... and most of them represent a better option in our view. 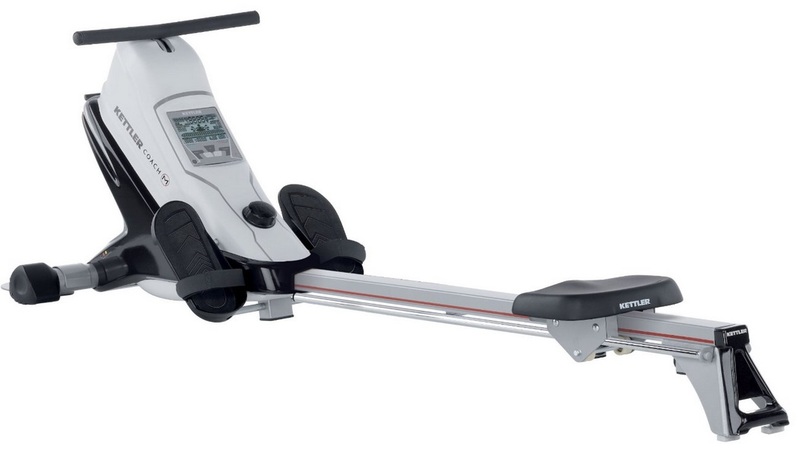 For less bucks you can buy the ever-popular Concept Model D. If you specifically wanted a magnetic rower, the LifeCore R100 will cost you more but you do get much more to show for it. The many water rowers in this price range are also well worth a look - these are the Waterrower, H2O Settle and the Prorower RX-950. 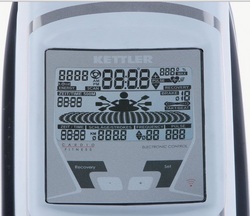 Do you own a Kettler Coach M? What's your view?